If you've chosen the CUSTOM Words option, please put your few words here. Thanks! Perfect gift for your trendy Teen or unique Auntie! Sometimes I like to just let my imagination soar when I'm making a piece of pottery! I rolled out porcelain clay, left in a wavy shape & stamped some decorative lace pieces into it. 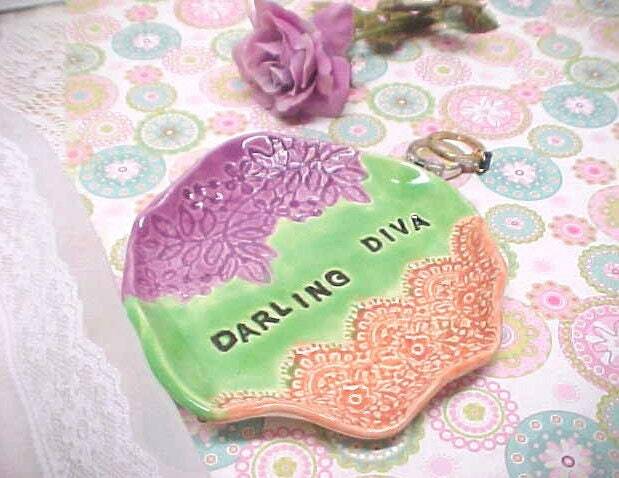 Then, it just called for a quirky title, so I stamped the words DARLING DIVA into it! Unique gift for your Favorite Diva! Measures about 3 to 4 inches wide in places & 5 inches top to bottom. Glazed in gorgeous Fuchsia, Green, & Peach. Cork pads on bottom. OR let me design a unique dish with YOUR OWN WORDS choices! Please contact me with your ideas!